The Grand Tourist, like Francis Basset, would become familiar with Antiquities, though this altar is an invention of the painter Pompeo Batoni, 1778. The primary value of the Grand Tour lay in its exposure to the cultural legacy of classical antiquity and the Renaissance, and to the aristocratic and fashionably polite society of the European continent. In addition, it provided the only opportunity to view specific works of art, and possibly the only chance to hear certain music. A Grand Tour could last anywhere from several months to several years. It was commonly undertaken in the company of a Cicerone, a knowledgeable guide or tutor. The Grand Tour had more than superficial cultural importance; as E. P. Thompson stated, "ruling-class control in the 18th century was located primarily in a cultural hegemony, and only secondarily in an expression of economic or physical (military) power." The legacy of the Grand Tour lives on to the modern day and is still evident in works of travel and literature. From its aristocratic origins and the permutations of sentimental and romantic travel to the age of tourism and globalization, the Grand Tour still influences the destinations tourists choose and shapes the ideas of culture and sophistication that surround the act of travel. In essence, the Grand Tour was neither a scholarly pilgrimage nor a religious one, though a pleasurable stay in Venice and a residence in Rome were essential. Catholic Grand Tourists followed the same routes as Protestant Whigs. Since the 17th century, a tour to such places was also considered essential for budding artists to understand proper painting and sculpture techniques, though the trappings of the Grand Tour—valets and coachmen, perhaps a cook, certainly a "bear-leader" or scholarly guide—were beyond their reach. The advent of popular guides, such as the book An Account of Some of the Statues, Bas-Reliefs, Drawings, and Pictures in Italy published in 1722 by Jonathan Richardson and his son Jonathan Richardson the Younger, did much to popularise such trips, and following the artists themselves, the elite considered travel to such centres as necessary rites of passage. For gentlemen, some works of art were essential to demonstrate the breadth and polish they had received from their tour. In Rome, antiquaries like Thomas Jenkins were also dealers and were able to sell and advise on the purchase of marbles; their price would rise if it were known that the Tourists were interested. Coins and medals, which formed more portable souvenirs and a respected gentleman's guide to ancient history were also popular. Pompeo Batoni made a career of painting the English milordi posed with graceful ease among Roman antiquities. Many continued on to Naples, where they also viewed Herculaneum and Pompeii, but few ventured far into Southern Italy, and fewer still to Greece, then still under Turkish rule. Rome for many centuries had been the goal of pilgrims, especially during Jubilee when they visited the Seven Pilgrim Churches of Rome. In Britain, Thomas Coryat's travel book Coryat's Crudities (1611), published during the Twelve Years' Truce, was an early influence on the Grand Tour but it was the far more extensive tour through Italy as far as Naples undertaken by the 'Collector' Earl of Arundel, with his wife and children in 1613–14 that established the most significant precedent. This is partly because he asked Inigo Jones, not yet established as an architect but already known as a 'great traveller' and masque designer, to act as his cicerone (guide). Larger numbers of tourists began their tours after the Peace of Münster in 1648. According to the Oxford English Dictionary, the first recorded use of the term (perhaps its introduction to English) was by Richard Lassels (c. 1603–1668), an expatriate Roman Catholic priest, in his book The Voyage of Italy, which was published posthumously in Paris in 1670 and then in London. [a] Lassels's introduction listed four areas in which travel furnished "an accomplished, consummate Traveller": the intellectual, the social, the ethical (by the opportunity of drawing moral instruction from all the traveller saw), and the political. The idea of travelling for the sake of curiosity and learning was a developing idea in the 17th century. With John Locke's Essay Concerning Human Understanding (1690), it was argued, and widely accepted, that knowledge comes entirely from the external senses, that what one knows comes from the physical stimuli to which one has been exposed. Thus, one could "use up" the environment, taking from it all it offers, requiring a change of place. Travel, therefore, was necessary for one to develop the mind and expand knowledge of the world. As a young man at the outset of his account of a repeat Grand Tour, the historian Edward Gibbon remarked that "According to the law of custom, and perhaps of reason, foreign travel completes the education of an English gentleman." Consciously adapted for intellectual self-improvement, Gibbon was "revisiting the Continent on a larger and more liberal plan"; most Grand Tourists did not pause more than briefly in libraries. On the eve of the Romantic era he played a significant part in introducing, William Beckford wrote a vivid account of his Grand Tour that made Gibbon's unadventurous Italian tour look distinctly conventional. The typical 18th-century stance was that of the studious observer travelling through foreign lands reporting his findings on human nature for those unfortunates who stayed at home. Recounting one's observations to society at large to increase its welfare was considered an obligation; the Grand Tour flourished in this mindset. The Grand Tour offered a liberal education, and the opportunity to acquire things otherwise unavailable, lending an air of accomplishment and prestige to the traveller. Grand Tourists would return with crates full of books, works of art, scientific instruments, and cultural artefacts – from snuff boxes and paperweights, to altars, fountains, and statuary – to be displayed in libraries, cabinets, gardens, drawing rooms, and galleries built for that purpose. The trappings of the Grand Tour, especially portraits of the traveller painted in continental settings, became the obligatory emblems of worldliness, gravitas and influence. Artists who particularly thrived on the Grand Tour market included Carlo Maratti, who was first patronised by John Evelyn as early as 1645, Pompeo Batoni the portraitist, and the vedutisti such as Canaletto, Pannini and Guardi. The less well-off could return with an album of Piranesi etchings. The "perhaps" in Gibbon's opening remark cast an ironic shadow over his resounding statement. Critics of the Grand Tour derided its lack of adventure. "The tour of Europe is a paltry thing", said one 18th century critic, "a tame, uniform, unvaried prospect". The Grand Tour was said to reinforce the old preconceptions and prejudices about national characteristics, as Jean Gailhard's Compleat Gentleman (1678) observes: "French courteous. Spanish lordly. Italian amorous. German clownish." 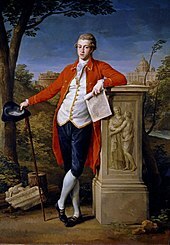 The deep suspicion with which Tour was viewed at home in England, where it was feared that the very experiences that completed the British gentleman might well undo him, were epitomised in the sarcastic nativist view of the ostentatiously "well-travelled" maccaroni of the 1760s and 1770s. Also worth noticing is that the Grand Tour not only fostered stereotypes of the countries visited but also led to a dynamic of contrast between northern and southern Europe. By constantly depicting Italy as a "picturesque place", the travellers also unconsciously degraded Italy as a place of backwardness. This unconscious degradation is best reflected in the famous verses of Lamartine in which Italy is depicted as a "land of the past... where everything sleeps." After the advent of steam-powered transportation around 1825, the Grand Tour custom continued, but it was of a qualitative difference — cheaper to undertake, safer, easier, open to anyone. During much of the 19th century, most educated young men of privilege undertook the Grand Tour. Germany and Switzerland came to be included in a more broadly defined circuit. Later, it became fashionable for young women as well; a trip to Italy, with a spinster aunt as chaperone, was part of the upper-class woman's education, as in E. M. Forster's novel A Room with a View. It should be noted that British travellers were far from alone on the roads of Europe. On the contrary, from the mid-16th century the grand tour was established as an ideal way to finish off the education of young men in countries such as Denmark, France, Germany, the Netherlands, Poland and Sweden. In spite of this the bulk of research on the grand tour concerns British travellers, a fact that has been lamented by some scholars who mean that our understanding of the grand tour would have been more complex if more comparative studies had been carried out. Recent scholarship on the Swedish aristocracy has demonstrated that Swedish aristocrats, though being relatively poorer than their British peers, from around 1620 and onwards in many ways acted as their British counterparts. After studies at one or two renowned universities, preferably those of Leiden and Heidelberg, the Swedish grand tourists set off to France and Italy, where they spent time in Paris, Rome and Venice and completed the original grand tour on the French countryside. The most common itinerary of the Grand Tour shifted across generations, but the British tourist usually began in Dover, England and crossed the English Channel to Ostend in Belgium,[b] or to Calais or Le Havre in France. From there the tourist, usually accompanied by a tutor (known colloquially as a "bear-leader") and (if wealthy enough) a troop of servants, could rent or acquire a coach (which could be resold in any city - as in Giacomo Casanova's travels - or disassembled and packed across the Alps), or he could opt to make the trip by riverboat as far as the Alps, either travelling up the Seine to Paris, or up the Rhine to Basel. Upon hiring a French-speaking guide, as French was the dominant language of the elite in Europe during the 17th and 18th centuries, the tourist and his entourage would travel to Paris. There the traveller might undertake lessons in French, dancing, fencing, and riding. The appeal of Paris lay in the sophisticated language and manners of French high society, including courtly behavior and fashion. This served to polish the young man's manners in preparation for a leadership position at home, often in government or diplomacy. From Paris he would typically sojourn in urban Switzerland, often in Geneva (the cradle of the Protestant Reformation) or Lausanne. ("Alpinism" or mountaineering developed in the 19th century.) From there the traveller would endure a difficult crossing over the Alps (such as at the Great St Bernard Pass), which required dismantling the carriage and larger luggage. If wealthy enough, he might be carried over the hard terrain by servants. Once in Italy, the tourist would visit Turin (and sometimes Milan), then might spend a few months in Florence, where there was a considerable Anglo-Italian society accessible to travelling Englishmen "of quality" and where the Tribuna of the Uffizi gallery brought together in one space the monuments of High Renaissance paintings and Roman sculpture, with side trips to Pisa, then move on to Padua, Bologna, and Venice. The British idea of Venice as the "locus of decadent Italianate allure" made it an epitome and cultural setpiece of the Grand Tour. From Venice the traveller went to Rome to study the ancient ruins and the masterpieces of painting, sculpture, and architecture of Rome's Medieval, Renaissance, and Baroque periods. Some travellers also visited Naples to study music, and (after the mid-18th century) to appreciate the recently discovered archaeological sites of Herculaneum and Pompeii, and perhaps (for the adventurous) an ascent of Mount Vesuvius. Later in the period, the more adventurous, especially if provided with a yacht, might attempt Sicily (the site of Greek ruins), Malta or even Greece itself. But Naples – or later Paestum further south – was the usual terminus. From here the traveller traversed the Alps heading north through to the German-speaking parts of Europe. The traveller might stop first in Innsbruck before visiting Vienna, Dresden, Berlin and Potsdam, with perhaps a period of study at the universities in Munich or Heidelberg. From there, travellers visited Holland and Flanders (with more gallery-going and art appreciation) before returning across the Channel to England. Eighteenth and nineteenth century Italian women, with their unfamiliar methods and routines, were opposites to the western dress expected of European women in the eighteenth and nineteenth century; their "foreign" ways led to the documentation of encounters with them, providing published accounts of the Grand Tour. James Boswell courted noble ladies and recorded his progress with his relationships, mentioning that Madame Micheli "Talked of religion, philosophy… Kissed hand often." The promiscuity of Boswell’s encounters with Italian elite are shared in his diary and provide further detail on events that occurred during the Grand Tour. Boswell notes "Yesterday morning with her. Pulled up petticoat and showed whole knees… Touched with her goodness. All other liberties exquisite." He describes his time with the Italian women he encounters and shares a part of history in his written accounts. Lord Byron's letters to his mother with the accounts of his travels have also been published. Byron spoke of his first enduring Venetian love, his landlord’s wife, mentioning that he has "fallen in love with a very pretty Venetian of two and twenty— with great black eyes — she is married — and so am I — we have found & sworn an eternal attachment … & I am more in love than ever… and I verily believe we are one of the happiest unlawful couples on this side of the Alps." Many tourists enjoyed sexual relations while abroad but to a great extent were well behaved, such as Thomas Pelham, and scholars, such as Richard Pococke, who wrote lengthy letters of their Grand Tour experiences. Inventor Sir Francis Ronalds’ journals and sketches of his 1818–20 tour to Europe and the Near East have been published on the web. The letters written by sisters Mary and Ida Saxton of Canton, Ohio in 1869 while on a six-month tour offer insight into the Grand Tour tradition from an American perspective. In 2009, the Grand Tour featured prominently in a BBC/PBS miniseries based on Little Dorrit by Charles Dickens. Set mainly in Venice, it portrayed the Grand Tour as a rite of passage. Kevin McCloud presented Kevin McCloud's Grand Tour on Channel 4 in 2009 with McCloud retracing the tours of British architects. In 2005, British art historian Brian Sewell followed in the footsteps of the Grand Tourists for a 10-part television series Brian Sewell's Grand Tour. Produced by UK's Channel Five, Sewell travelled by car and confined his attention solely to Italy stopping in Rome, Florence, Naples, Pompeii, Turin, Milan, Cremona, Siena, Bologna, Vicenza, Paestum, Urbino, Tivoli and concluding at a Venetian masked ball. In 1998, the BBC produced an art history series Sister Wendy's Grand Tour presented by British Carmelite nun Sister Wendy. Ostensibly an art history series, the journey takes her from Madrid to Saint Petersburg with stop-offs to see the great masterpieces. The 2016 Amazon motoring programme The Grand Tour is named after the traditional Grand Tour, and refers to the show being set in a different location worldwide each week. ^ Ostend was the starting point for William Beckford on the continent. ^ Gross, Matt (September 5, 2008). "Lessons From the Frugal Grand Tour". Frugal Traveler. New York Times. Archived from the original on September 29, 2008. Retrieved July 22, 2016. ^ Thompson, The Making of the English Working Class 1991:43. ^ Colletta, Lisa (2015). The Legacy of the Grand Tour: New Essays on Travel, Literature, and Culture. Fairleigh Dickinson University Press. p. 226. ISBN 978-1611477979. ^ "''Pilgrimages''". Newadvent.org. Retrieved 2012-07-20. ^ E. Chaney, "Gibbon, Beckford and the Interpretation of Dreams, Waking Thoughts and Incidents", The Beckford Society Annual Lectures (London, 2004), pp. 25–50. ^ Paul Fussell (1987), p. 129. ^ Noted by Redford 1996, Preface. ^ Anna., Frank-van Westrienen, (1983). De groote tour : tekening van de educatiereis der Nederlanders in de zeventiende eeuw. Amsterdam: Noord-Hollandsche Uitgeversmaatschappij. ISBN 044486573X. OCLC 19057035. ^ 1971-, Winberg, Ola, (2018). Den statskloka resan : adelns peregrinationer 1610–1680. Uppsala: Acta Universitatis Upsaliensis. ISBN 9789151302898. OCLC 1038629353. ^ The Registro dei viaggiatori inglesi in Italia, 1618–1765, consists of 2038 autograph signatures of English and Scottish visitors, some of them scholars, to be sure. (J. Isaacs, "The Earl of Rochester's Grand Tour" The Review of English Studies 3. 9 [January 1927:75–76]). ^ Redford, Bruce. Venice and the Grand Tour. Yale University Press: 1996. ^ Eglin, John. Venice Transfigured: The Myth of Venice in British Culture, 1660–1797. Macmillan: 2001. ^ "The captured cargo that unpacks the spirit of the grand tour". The guardian. Retrieved 4 August 2017. ^ Freller, Thomas (2009). Malta & The Grand Tour. Malta: Midsea Books. ISBN 9789993272489. ^ Black, "Fragments from the Grand Tour" The Huntington Library Quarterly 53.4 (Autumn 1990:337–341) p 338. ^ Andrews, A Comparative View of the French and English Nations in their Manners, Politics, and Literature, London, 1785. ^ Coxe, Sketches of the Natural, Political and Civil State of Switzerland London, 1779; Travels into Poland, Russia, Sweden and Denmark London, 1784; Travels in Switzerland London, 1789. Coxe's travels range far from the Grand Tour pattern. ^ Craven, A Journey through the Crimea to Constantinople London 1789. ^ Thicknesse, A Year's Journey through France and Part of Spain, London, 1777. ^ a b c Iain Gordon Brown, "Water, Windows, and Women: The Significance of Venice for Scots in the Age of the Grand Tour," Eighteenth-Century Life, November 07, 2006, http://muse.jhu.edu/article/205844. ^ George Gordon Byron and Leslie A. Marchand, Byron's Letters and Journals: The Complete and Unexpurgated Text of All Letters Available in Manuscript and the Full Printed Version of All Others (Newark: University of Delaware Press, 1994). ^ Jeremy Black, Italy and the Grand Tour (New Haven: Yale University Press, 2003), 118-120. ^ "Sir Francis Ronalds' Grand Tour". Sir Francis Ronalds and his Family. Retrieved 9 Apr 2016. ^ Belden, Grand Tour of Ida Saxton McKinley and Sister Mary Saxton Barber 1869 (Canton, Ohio) 1985. Edward Chaney (2004), "Richard Lassels": entry in the Oxford Dictionary of National Biography. Edward Chaney, The Evolution of the Grand Tour: Anglo-Italian Cultural Relations since the Renaissance (Frank Cass, London and Portland OR, 1998; revised edition, Routledge 2000). ISBN 0-7146-4474-9. Sánchez-Jáuregui-Alpañés, Maria Dolores, and Scott Wilcox. The English Prize: The Capture of the Westmorland, An Episode of the Grand Tour. New Haven, CT: Yale University Press, 2012. ISBN 978-0300176056. Stephens, Richard. A Catalogue Raisonné of Francis Towne (1739–1816) (London: Paul Mellon Centre, 2016), doi:10.17658/towne. Geoffrey Trease, The Grand Tour (Yale University Press) 1991. Andrew Witon and Ilaria Bignamini, Grand Tour: The Lure of Italy in the Eighteenth-Century, Tate Gallery exhibition catalogue, 1997. Clare Hornsby (ed.) "The Impact of Italy: The Grand Tour and Beyond", British School at Rome, 2000. Ilaria Bignamini and Clare Hornsby, "Digging and Dealing in Eighteenth Century Rome" (Yale University Press, New Haven and London, 2010). Roma Britannica: Art Patronage and Cultural Exchange in Eighteenth-Century Rome, eds. D. Marshall, K. Wolfe and S. Russell, British School at Rome, 2011, pp. 147–70. Henry S. Belden III, Grand Tour of Ida Saxton McKinley and Sister Mary Saxton Barber 1869, (Canton, Ohio) 1985. Wikimedia Commons has media related to Grand Tour. Wikivoyage has a travel guide for Grand Tour. Wanderings in the Land of Ham by a daughter of Japhet, London : Longman, Brown, Green, Longmans, & Roberts, 1858. A description of an Oriental Grand Tour at the Internet Archive Digital Library.